Today -- an exclusive first look at a new report that says you can put a price on success when it comes to Congress. The report by Issue One exposes the secretive money system in which members of Congress "buy" top spots on the most powerful committees. To raise the money, they often collect from the very interests their committees are supposed to oversee. Nick Penniman: It's not only a powerful position, it's a perverse system. In fact, it's the inverse of what we all as citizens should want. Nick Penniman leads the group - Issue One. 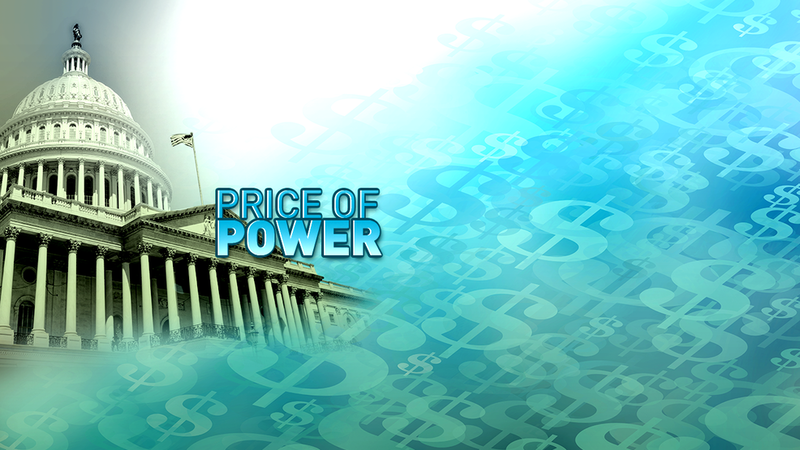 Its new report The Price of Power exposes how members of Congress serve as cash cows for their party’s political machinery. The best fundraisers are rewarded with powerful positions that decide the laws affecting all of us. Insiders report both parties have similar systems of “dues” that members have to pay every two years by raising money directly for the party. That’s called “dialing for dollars;” and by giving some of their campaign funds to the party and to colleagues facing tough races. How much they raise determines who gets ahead. Nick Penniman: What we should want is that people rise in stature because of merit, not because of money. And right now, it's money over merit. As an example, ordinary Republicans have six-figure party “dues.” But it takes more to make the ranks of leadership. Sharyl Attkisson: How much does a committee chairmanship cost? Nick Penniman: So, if you want to be the chairman of a major committee in Congress, and you're Republican, you've got to deliver 1.2 million to the Republican National Congressional Committee. Democrats, it's about the same thing. Sharyl Attkisson: It's almost like paying for the privilege of obtaining a certain position. Nick Penniman: It is borderline extortion. It’s a far cry from bygone days. In the 1960s a mere $100 donation could get you not only dinner with congressional candidate Shirley Temple, but also host Bing Crosby. Today, besides the $1.2 million required of “A” committee chairmen, Republicans who chair secondary “B” committees are expected to raise $875,000 in dues. The top Republican in the House, as Speaker, has to raise $20 million dollars. The number two, Majority Leader $10 million. Such details, held tightly to the vest for years, come from some of the 180 former public officials who belong to “Issue One’s” bipartisan “ReFormers Caucus” and say they’re sick of money’s influence in politics. Connie Morella: I think we have reached crisis proportions when it comes to money. A member of Congress devotes almost one-third of every day to raising money. Former Senate Majority leader Tom Daschle. Tom Daschle: People leave on Thursday. They come back on Tuesday and try to govern on Wednesday these days and you can’t run a country this complicated with the challenges we face and spend so little time doing so. Former Labor Secretary Bill Brock. Bill Brock: If you tell me the problem of money in politics, the distortions that it creates is just gonna keep getting worse, shoot me. Shoot me. Zach Wamp: It's a flawed system and it's like a nuclear arms race. The Democrats do more of it because the Republicans do more of it. Tennessee Republican Zach Wamp co-chairs the ReFormer’s Caucus. He was in Congress from 1995 to 2011. Sharyl Attkisson: How are the members told how much money that they ought to raise? Zach Wamp: So, the committees, usually in the spring, and they just did this a month ago. They come out with a quota and it basically says that if you're a chairman of a regular committee, it's X dollars, and if you're a chairman of an A committee, an exclusive committee, it's even higher. If there's enough money in your campaign account, you can just cut a check, or, if you don't have enough money, you have to go over in what's called 'dialing for dollars'. You sit in a little booth, they give you a list, you call people that you don't know who don't want you to call them, by the way, and you ask them for money, you tell them we have this spring event coming up, and maybe President Trump is going to be there, and will you please dedicate 10 or 25 thousand dollars or 50,000 dollars to this dinner and they keep a total of it, and you see people advance to committee chairmanships and into leadership, based on how much time they spend during the work day, taxpayer expense, making calls, shaking down the special interests. Sharyl Attkisson: With all that pressure to raise money, sometimes these committee members are raising it from the interest they're supposed to regulate, true? Zach Wamp: Well, not only do they, they actually intentionally give you those lists of people that have something to do with your committees, because they know that they're the ones that are most likely to say yes. Sharyl Attkisson: Doesn't that pervert the system by which the members of these committees become beholden to the very people that they're supposed to regulate or oversee? Zach Wamp: Of course, yes. For example, the House Financial Services Committee oversees matters involving everything from Wall Street and insurance to the stock exchanges. Nick Penniman: The big joke in Washington is that the financial services committee is called the cash committee. Not because it deals with finances, but because just being on it allows you to raise so much money from bank lobbyists and bankers that it's like an ATM machine. The cash just pours in. On the heels of the mortgage crisis, as the financial services committee considered new regulations on banking and real estate, money poured in from those industries. From 2009 to 2016, the Republican chairman of the committee, Jeb Hensarling, raised $10.1 million, half of it from finance, insurance, and real estate interests. He transferred $8.6 million of it to the National Republican Campaign Committee and other House Republicans. The committee’s lead Democrat, Maxine Waters, raised $3.7 million, one-quarter of it from finance, insurance, and real estate donors. She transferred about $798,000 of that to the Democratic Congressional Campaign Committee and other House Democrats. Hensarling and Waters didn’t respond to our requests for comment. Sharyl Attkisson: If there are members on the Financial Services Committee and they're having to raise that much money, and they're taking it from the banks they regulate, who's going to have the leg up when it comes to the kinds of laws that they support? Nick Penniman: The kind of sad joke in Washington is you "lean towards the green". And when you're on the Financial Services Committee, let's say, and most of your money or a big chunk of your money's coming from bank lobbyists that you’re supposed to be regulating, unfortunately, you’re probably going to lean more towards what they want. The Democratic Congressional Campaign Committee and National Republican Campaign Committee didn’t respond to our repeated requests for interviews and comment. Zach Wamp: The system is so bad that the members hate it. Members of Congress hate to do it. The people they're calling hate to be called. Sharyl Attkisson: What happens if they buck it? If someone says, I'm not going to raise this money? Zach Wamp: You won't advance and they'll put their thumb down on you, they even ridicule you publicly at the meetings; this person is not making the calls. They're not raising the money. So, while they might rather be taking care of the people’s business, many spend countless hours catering to the interests that will help them pay their party dues. Zach Wamp: And I hate to use this word, but it makes prostitutes out of our elected officials. When the leadership says, if you want to advance, you have to demean yourself and go over there at taxpayer time and make phone calls to people that don't even want to talk to you, asking them for money for your party so that you can somehow advance the cause of good government. It really needs to change and it's going to take the country, because I can tell you, they're not going to change it because they're stuck in the system and they're proliferating against each other, the two parties.